I had been wanting to go and watch Greenwich Borough for a while now and for some reason other games had got in the way, but determined to not hold it off any longer I made the decision to go and see them play Sittingbourne on December 16th. Going into the game Greenwich had drawn the last four and with only two places between the two teams in the league I was fully expecting this to be a close one. Transport wise this ground is easy to get to. 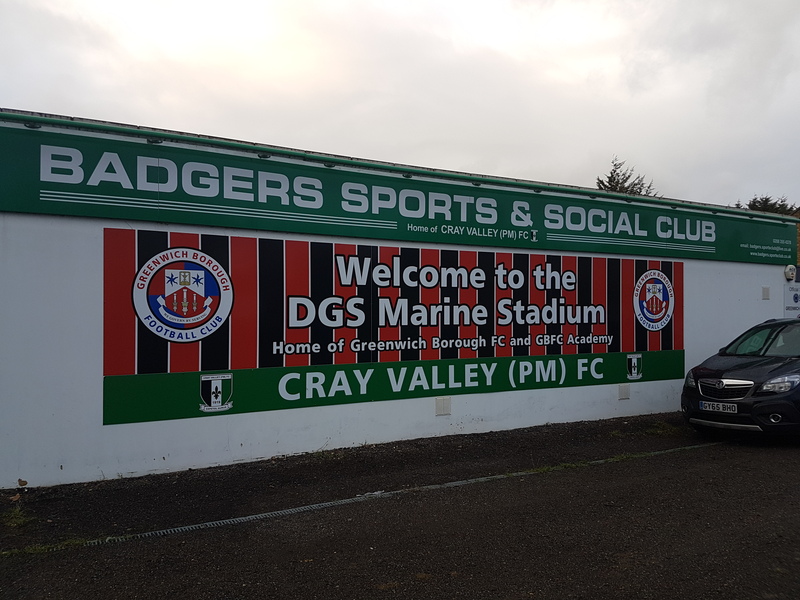 Situated just off the South Circular and on a few major bus routes it could not be easier and with a decent size Car Park for the size of crowd there really is no excuse not to visit the DGS Marine Stadium. The Clubhouse immediately welcomes you in and with two rooms, both showing the Sky Sports Live Match, there was plenty of seating options to be taken and with one having a view of the pitch and the players warming up it is here I sat as I looked at the team news whilst sampling a pre-christmas pint. Access could then be gained to the ground directly from the Clubhouse or through the turnstile. Easy. The two teams lined up very differently. Sittingbourne set out with a big man up top and with runners hoping to exploit the knock downs. Borough played a more flexible 4-3-3 style with the wide forwards expected to track back when the visitors were on the attack. I was familiar with many of the players as most had been on the local scene for a while and although I was disappointed to not see Ali Fuseini get a run out I was looking forward to seeing recent signing Chinedu McKenzie who had hit 3 goals in his 3 games with the club so far. The weather was not great so an early call was made to start under the shelter of The Woodcock Stand before being attracted towards the end that Greenwich were attacking as the first half was in progress. For the first 40 minutes the game was fairly uneventful. I was almost to the point of regretting not choosing to visit the Phoenix Sports or Glebe match instead, however it soon came to life and then managed to stay that way through to the end. 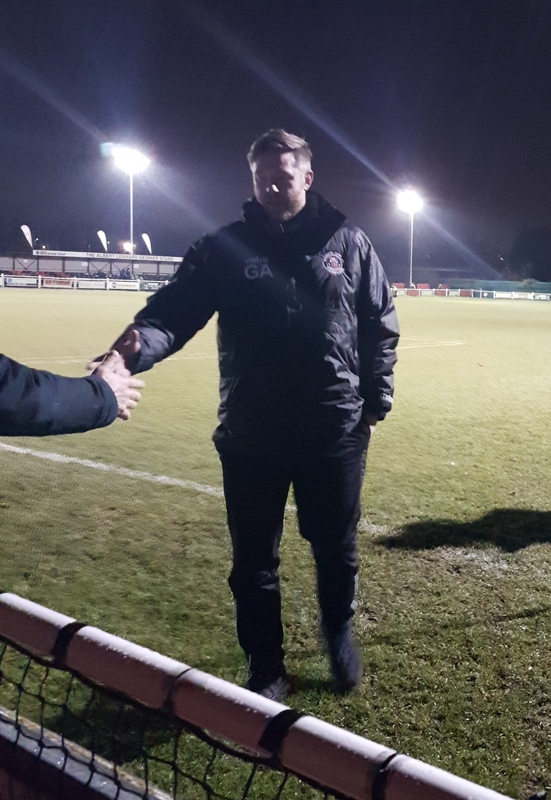 Greenwich had shaded play in the first half so it was a surprise when Sittingbourne had the first clear cut chance with 5 to go until the break when their centre back, John Coker, intercepted the ball and drove up the pitch unchallenged. A one-two with his winger put him through one-on-one against the rather imposing George Kamurasi. Fortunately he finished like a natural defender and the game was still goalless. Not for long though! The left side of defence seemed to be a weakness for Sittingbourne and Jack Barham exploited that on 43 minutes when he drove into the box and using a mixture of skill and determination he sat Coker on his backside before pulling the ball back for an on-rushing Sam Corne to fire low into the bottom corner. 1-0. Probably a deserved half-time lead to be fair. Or maybe not. Just before the whistle Sittingbourne got back into it. Kane Rowland cut in from the left side and curled the ball towards the top corner, Kamarusi managed to get a hand to it and put it out wide of the goal area however right back Salvyn Kisitu was quickest to react and squeezed the ball home from a tight angle. 1-1 and half-time. Back to the warmth of the clubhouse to see the half-time scores from elsewhere and attempt to get some feeling back into the hands. Those surroundings were actually so inviting that I somehow missed the kick-off for the second half, a first for me, and was fortunate not to miss any relevant action. That didn’t occur until just after the hour mark. 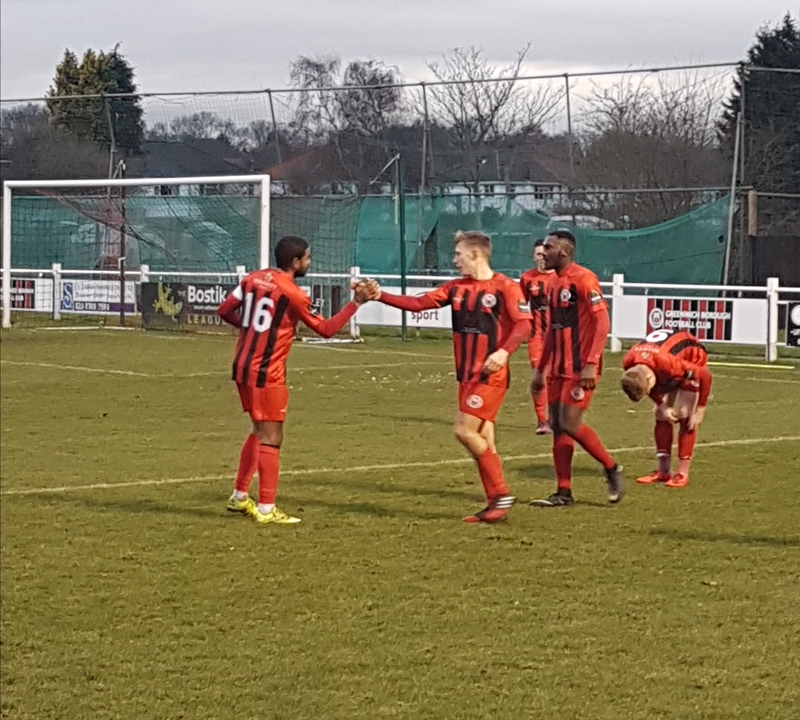 Chinedu McKenzie had been causing problems all afternoon from his wide right starting point but on this occasion he had a simple task on hand as the ball broke from a bit of a goalmouth scramble and he was there to poke it home from a few yards out. 4 in 4 for the young attacker is certainly a good start to his career with the club. 2-1. It got better for him a few minutes later as he claimed a goal assist when he found himself on the edge of the area and played a simple ball to Jack Barham who with plenty of work still to be done curled a 25 yard beauty into the top left corner of the goal past a diving Jordan Carey. It was a wonderful goal from the 21 year-old who this season moved from Phoenix to play for Borough. 3-1. Greenwich were dominant now and Sittingbourne could not cope. It was an effective formation aswell as talent that was winning them this game. Danny Fitzsimmons sits infront of the back four stopping everything that comes his way. He usually plays it simple for the craft of Jack Sammoutis or guile of Sam Corne to dictate the next attack for Greenwich. Then with the attacking three still ahead of them the options are plentiful. It was one of these attacks that led to the killer fourth goal. The tireless McKenzie thought he had got another one for his tally when he shot from the edge of the area, unfortunately for him it was an inch to high and could only rebound off the bar. 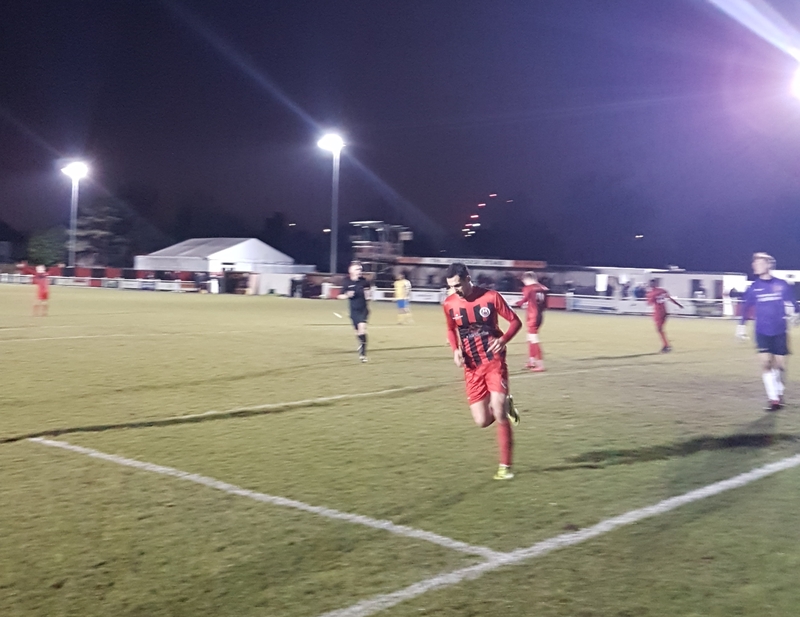 That rebound though fell to Jack Sammoutis who prodded home to put this one as a contest to bed and make it 4-1 to Greenwich Borough. The home side were now able to tinker with their formation, make substitutions and see the game out. They even had time for Jack Barham to cap off his Man of the Match display by getting his second of the game before the end. Travis Gregory had replaced McKenzie and immediately showed his talent by breaking into the box before firing it across to Barham who had the simplest of tasks and fired it home. Despite the impressively loud Sittingbourne fans singing that they were going to win 6-5 the away team were disappointing. It was easy to blame the keeper as he was having a poor game but this match was won in the dugout for me and Gary Alexander deserves credit for sending out such an attacking line-up for what appeared a very tight match on paper. As the referee blew the final whistle I also thought about the part he and his colleagues had played in the game. I often find officiating very poor or at best inconsistent at this level but Andy Bennett and his assistants were very good today. I liked the way he gave a brief explanation as to why he made a call, if he made a decision that was challenged but then quickly prevented any significant ‘backchat’ by reminding the questioning player that he himself was in charge. Credit where credit is due, he had a good match. Greenwich have a decent chance to achieve something this season. They may have lost their edge over the last few games but they were ruthless today and if they are like this over the Christmas period they will be set up to challenge for honours as the season gets down to the key final stages. 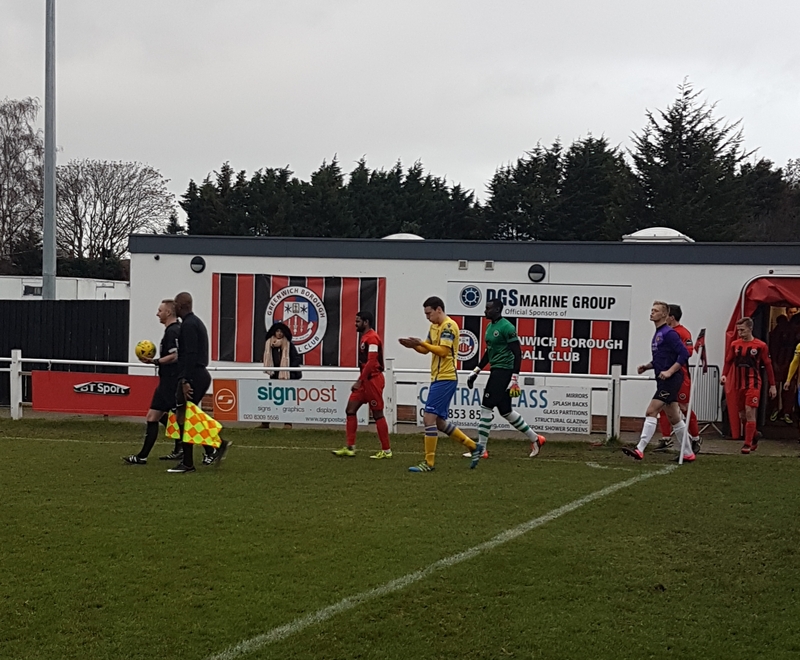 Cray Wanderers and Lewes will be favourites to win the league but if either slip up then the team from the DGS Stadium in Eltham could well be in the right place to take advantage. On the pitch I certainly liked what I saw from this visit, it was hard not to be impressed, however I was also highly satisfied by the feel of the club. I visit lots of the local teams and on the whole they are all welcoming and warm as this was but what I also liked about this place was that the supporters were friendly too. There was no vicious or harsh language which can be so consistent and needless on terraces elsewhere. This was a huge plus point for me. I am not against bad language on the whole but when it is constant and pointless I feel it can make a club less attractive for families to return to and with football being a business and community hub nowadays this is an area that some clubs should look at attacking in my point of view. The small but humorous faithful behind the goal enjoyed their day and I enjoyed mine, I will be back someday soon, and maybe next time I will even bring the kids.